Republicans: Trump’s losing streak continues. Is a contested convention inevitable? Colorado is odd in that it dribbled out delegates over a couple of weeks. The 6 from the 1st and 6th congressional districts were already included when the Michigan results came out. Those 6 were all Cruz. Since then I added notes about the rest of Colorado’s congressional districts to the Michigan post. Cruz won all 15 of those delegates. Then yesterday Cruz won all 13 at large delegates. There are 3 more delegates from Colorado who are state party leaders and have not yet expressed a preference. But Cruz has won all 34 of Colorado’s delegates that were available via the caucus process. Since March 23rd, Trump has gotten bad news in Alaska, American Samoa, Louisiana, North Dakota, Wisconsin and Colorado. Some of those were “new” results in states, others were just updates as more information came in. Either way, none of those updates went Trump’s way. After Arizona and Utah Trump needed 52.22% of the remaining delegates to be on a winning pace. Since then the delegate deltas have been Cruz +78, Trump +6, Rubio +4, Kasich +1. And that Kasich delegate is being generous interpreting one uncommitted delegate’s comments. That might actually be a Cruz delegate in the end. So Cruz got 78/89 = 87.6% of the delegates. Trump got 6/89 = 6.7% of the delegates. Needless to say this is far below the 52.22% Trump needed to improve his position. 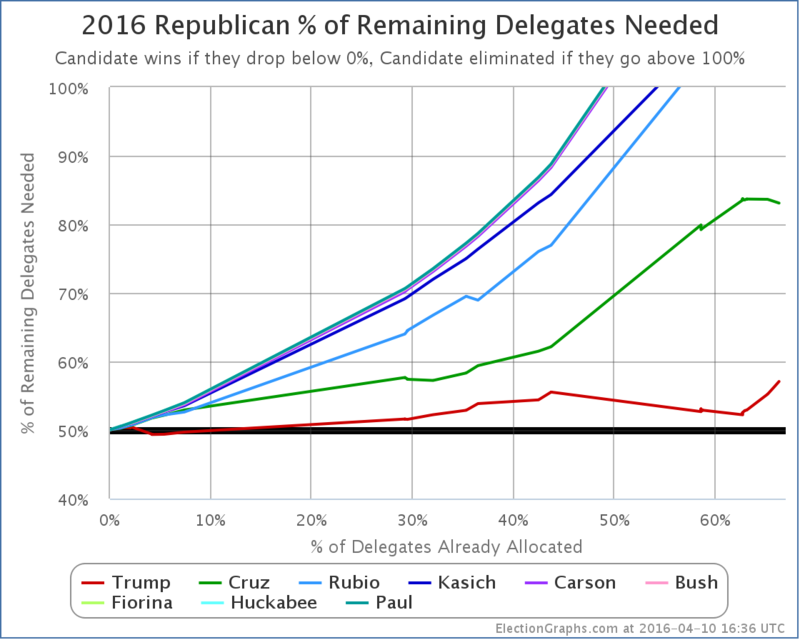 Instead, he goes from needing 52.22% of the remaining delegates to needing 57.07%. This is huge change. Winning 57.07% of the delegates would represent a 23% improvement over the 46.46% of delegates pace he has so far. That is a pretty substantial improvement. Trump is in the worst position he has been so far. This is not where he wants to be. Everything is going in the wrong direction. But is it time to assume a contested convention yet? The drum beat about that has certainly begun. Both of these two outline scenarios where Trump can still get to 1237. These are not highly unlikely scenarios like those required to get to a Sanders win on the Democratic side, but rather perfectly reasonable possibilities given current polling data. Trusting current polls completely, Wang actually gets a 92% chance of Trump getting the delegate majority. When he adjusts for the fact Cruz has been over performing his polls, that drops to 70%. This is by no means certain, but it is still more likely than not. In addition you can run your own simulations at The Upshot or FiveThirtyEight. With either of these it is not that hard to get Trump to 1237. Try it yourself. It is fun. My own take is that some of Wang’s assumptions about how uncommitted delegates will break is a bit generous to Trump given his performance so far with uncommitted and unbound delegates. So 70% chance of an outright majority seems a bit high. Trump was EXPECTED to do badly in Colorado and Michigan… perhaps not quite this badly, but still it means that it is easy to get distracted by notions of “momentum” that may or may not be real. The fact that Trump did well in Arizona, but then badly in Colorado does not represent a change in the state of the race. It is just a function of the makeup of those states and the calendar. To see if things have really changed from being “right on the edge between a Trump win and a contested convention” we need to see deviations against how the remaining states are expected to play out. We haven’t seen that quite yet. But all the anti-Trump forces are pushing against him hard and Trump has no margin for error in the remaining states. He has to do well in all the places he is expected to do well. He might actually need to exceed expectations by a bit. If he starts dipping, even a little bit, then we are at a contested convention. And given what appears to be Cruz’s skill at collecting “ghost delegates” who are bound to Trump on the first ballot but who really support Cruz, a Trump loss on the first ballot almost certainly means Cruz (or maybe someone else, but probably Cruz) wins on a later ballot. Keep watching New York and if Trump stays over 50% in the popular vote, which will get him all or almost all of the delegates. That is the next big test. If Trump underperforms expectations in New York, we almost certainly will have a multi-ballot convention. If he matches or exceeds expectations, then the path to an outright Trump win remains open. On this week’s Curmudgeon’s Corner Sam and Ivan hit all the things you would expect about Election 2016, the attacks in Brussels and the announcements at the latest Apple event. They also talk a bit about fitness, #ManInTree, Waze, Obama in Cuba and more! Even a bit about events in the Nixon administration! 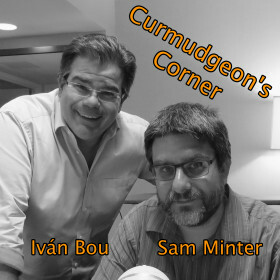 This week on Curmudgeon’s Corner, Sam and Ivan talk about Sam’s son’s trip to the doctor, they respond to a bunch of listener feedback, talk a bit about Apple and Nancy Reagan, and then finally jump into Election 2016. Within that topic they cover the charges of Trump inciting violence, the delegate math, what might happen at a contested convention, explanations for the Sanders win in Michigan… and more!